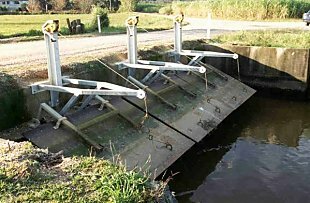 A floodgate is a top-hinged flap installed across a waterway to prevent water entering particular areas. In NSW, large areas of coastal floodplain and natural watercourses have been artificially drained and floodgates installed. Floodgates were first installed in Australia in the late 19th century. The majority of these structures were installed after major flood events in the 1950s and 1970s. These were usually constructed from steel. Standard floodgates operate passively as one-way valves. Water is prevented flowing upstream by the hinged flap and yet can flow out when the downstream water level allows. They are designed to prevent inundation of low-lying land by high tides or flood events. A structural solution includes any physical modification that allows for regulated amounts of water to flush the system during non-flood periods. A winch system lifts the whole floodgate clear of the water column, allowing for maximum flushing. This type needs someone to operate the winch on a regular basis to achieve the best results. A sluice gate is comprised of a hole cut into the main floodgate with a sliding metal panel that can be adjusted to cover more or less of the aperture. This requires less operational intervention than a winch. A tidally-operated floodgate also has an aperture with a panel, but the panel is opened and closed by a float mechanism on the downstream side of the floodgate. As the water level rises (due to floods or high tide) the panel is closed shut. When water levels fall to acceptable levels, the float opens the panel over the aperture allowing for controlled flushing again. Tidal gates do not require regular, active intervention once they have been installed. These include providing incentive payments for the installation of floodgate modifications, stewardship payments for alternative land use and possible removal of structures where they are no longer required. Better results are achieved by working closely with local Councils and farmers. When the benefits of active floodgate management are recognised by the stakeholders for themselves, the adoption of improved management techniques accelerates. This includes comprehensive monitoring programs of fish stocks, water quality and vegetation. Communication involves distribution of educational material such as brochures, posters, broadcast quality video, and websites. A return to natural flows through managed floodgates leads to rapid and sustained improvements in water quality ¡V including higher dissolved oxygen levels, moderated temperature fluctuations and less acidity. 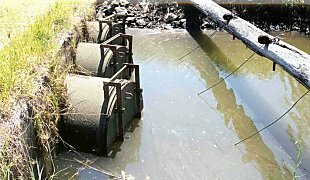 Opened floodgate systems have been shown to have a greater fish and prawn diversity and far higher numbers of individuals, than unmanaged sites. This is due to both improved fish passage and enhanced habitat values. Active floodgate management enhances production for both farmers who graze stock and those who grow crops. Instream weeds are controlled naturally and wetlands once again become important drought fodder refuges for stock. Through the relatively simple tool of opening floodgates in non-flood periods, acid scalds can be kept moist to reduce further acid production and lead to a whole suite of flow-on benefits. Most floodgate management projects involve the following steps. Contact the manager / owner of the floodgate (usually the local council or a landholder). Discuss the proposal with all landholders upstream of the floodgate.Assess the suitability of the site in terms of any areas of low elevation, salinity levels, tidal range, soil permeability, etc. Conduct any necessary "before" monitoring such as water quality, fish monitoring, vegetation photo-points, etc. Select the appropriate style of floodgate modification. Monitor water levels, particularly at any areas of low elevation, and conduct any complementary "after" monitoring. Adjust the modification to allow in more or less water as necessary. Usually a written agreement is signed by all stakeholders to clarify the aims and responsibilities of those involved. NSW DPI completed a two-year NSW Environmental Trust funded project to open 50 floodgates in the Richmond, Clarence and Macleay catchments during non-flood periods to reinstate fish passage and improve water quality within floodgated creeks. 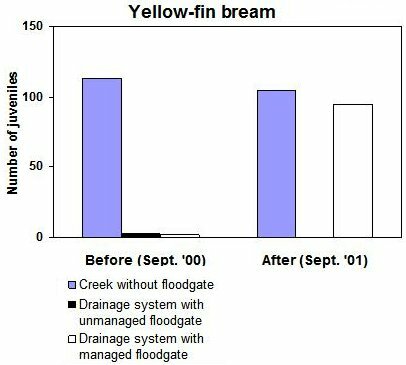 Monitoring has produced evidence of the excellent benefits of floodgate management for fish movement and water quality. For example, in the Macleay catchment, active floodgate management has improved water quality and reinstated fish passage to over 14km of waterways. Fish sampling has revealed a diverse native fish community following active management. Species including Australian bass, short and long-finned eels, sea mullet, bream, juvenile luderick, gudgeons and an abundance of school prawns were found in the creek. Further funding of over $95,000 from the NSW Environmental Trust enabled on-ground rehabilitation works at Rocky Mouth Creek, Richmond River to be undertaken. This partnership with six landholders and other state agencies aimed to improve coastal floodplain management to prevent dissolved oxygen problems from decomposing vegetation following flooding. The works should provide benefits to landholders, recreational fishers and commercial fishers.